Any drying process is based on the fact that water molecules change from liquid into gas, called vapour. This requires energy. Our option is freely available solar energy. pressure inside the sludge and the ambient air. In order to avoid an equilibrium between the vapour pressure inside and outside the sludge, the air has to be evacuated. This is naturally helped by the fact that water vapour is lighter than dry air. The warmer the air is the more water vapour can be transported. However the partial vapour pressure in the air rises with the amount of water dissolved in the air. For more detail see the h/x-diagram of Mollier. Except for very damp days, the drying process still occurs even in low sunshine. This is the same process that allows a wet road to dry at night. They are naturally ventilated by the wind. The higher the wind speed blowing over the sludge surface, the faster the drying speed. However at sites with regular rainfall, an open air drying bed is not as satisfactory. For this reason in Middle Europe open air drying beds are no longer in use. 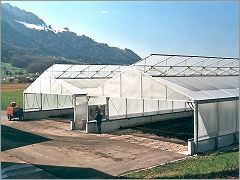 Solar drying is done in greenhouses which require controlled ventilation systems. An efficient ventilation system has been developed and monitored in the different plants and sites where WendeWolf® turning machines are installed. Motor driven roof ventilation flaps are installed over the entire length of the drying hall. These are similar to those used in many greenhouses for ventilation. Fans are placed inside the hall in such a way that air turbulence is created above the entire surface of the drying bed, destroying the moist boundary layer above the sludge surface. This artificial wind is important for the drying process as it avoids any stratification of temperature or humidity. An aperture slit is positioned between the greenhouse and the walls on which the WendeWolf® is travelling. Whenever the roof flaps are opened, a natural draft occurs and fresh, dry air enters the greenhouse. The temperature and the relative humidity is monitored outside and inside each hall. The PLC (Process Logical Control) calculates the temperature difference and the absolute water content inside and outside for each hall separately. The respective thresholds can be altered. The axial fans are controlled by the temperature difference inside/outside blowing the warm air downwards and breaking up the moist layer of air at the sludge surface. The hall must have doors and the roof flaps are able to be closed to limit thermal energy loss. The flaps are only opened when the absolute water content of the air inside has reached a certain ratio to the outside ambient air. As warm and moist air rises, the exchange is rapidly achieved and the flaps close again.